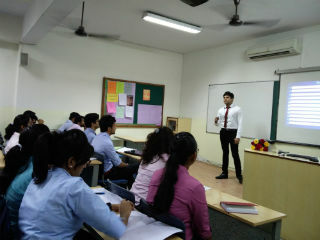 On 22nd July 2017, a special session on GST was conducted for PGDM Year I students of Section B. The aim was to help them understand the complexities of GST. The resource person for the session was Mr Ishaan Goel, a qualified Chartered Accountant, who is currently associated with Kohli Chitkara and Co. He has played an active role in analysing the impact of GST on companies and has been on many news channels as a tax guru and GST expert. He shared very useful and foundational highlights of the GST regime. He talked about the tax structure in India and how it took more than a decade to implement this change in tax regime. He also discussed the details of the differences in tax liabilities and the differences in calculation mechanism in the pre and post GST regime. 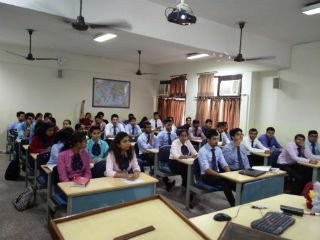 The session was very interactive and gave the students ample opportunities to raise queries and seek answers. The session concluded with a vote of thanks and a thunderous applause for the great knowledge sharing by Mr. Goel.